Expletive Inserted » Stripe’s New Online Payments Service: Where’s the Catch? Stripe’s New Online Payments Service: Where’s the Catch? When I wrote about recurring payment solutions in March I called Saasy “without doubt the simplest recurring billing payments solution the world has ever seen.” I thought it was expensive though, and it doesn’t have data portability. You can’t move your customers’ credit card data to another provider. You are locked in. Braintree was my overall favorite of all the options I looked at. Their cost was very reasonable and they are strong advocates of data portability. Having now completed the integration with our app I can say based on first hand experience that their API is easy to use and nicely thought out. Their transparent redirect is a clever way to eliminate most of the PCI compliance hassles associated with taking credit cards. No setup fees, no monthly fees, no card storage fees, no hidden costs: you only get charged when you earn money. In reality there is one other potential cost: a $15 chargeback fee when someone reverses a payment. 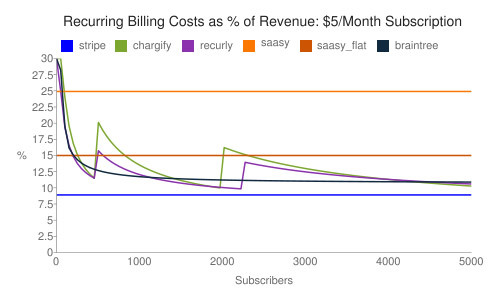 I have updated my Recurring Payments Cost Calculator, so if you are looking for a subscription billing solution you can see for yourself how Stripe compares to Braintree, Chargify, Recurly and Saasy. If that’s too much work, just check out the two situations below, $5 and $50 subscription fees for up to 5000 subscribers. Stripe is the new low cost leader for small subscriptions, and is extremely competitive for larger ones. For $50 subscriptions, Chargify and Recurly are cheaper options, but not by much and they involve a lot more complexity because in both cases you bring your own merchant account and payment gateway. Stripe also seems to meet all of my other requirements. You can use it to create a payment form that lives on your own site, which means the user experience is all within your control. And PCI compliance issues seem to be minimized because the credit card number never hits your server. As with Braintree and Saasy, you don’t need to worry about setting up your own payment gateway or merchant account. For sure! If you ever want to move to another provider, we’ll export your data for you. I haven’t had a chance to use Stripe, so the catch might still be out there. And Stripe is a newcomer that doesn’t have the industry pedigree and experience of Braintree. But the service is interesting enough that I’m going to put the launch of our subscription offering on hold while I check it out. Updated 1/20/2012: A few people pointed out that Recurly has updated their pricing and I have modified the calculator (though not the charts above). See the discussion on Hacker News. Posted: October 2nd, 2011 under The Wild Web. Congrats to Stripe! They have officially launched and they look great for developers and US based businesses. If you’re not from the US, or your not a developer, or you want to get to market fast and grow quickly without limitations, you may be interested in http://www.SimplifiedEcommerce.com. We support international businesses and you can get started right away with zero coding – without the long complicated hassle of getting your own merchant account. We cover the entire payments stack- gateway, vault, instant PCI compliance, recurring subscription management and Affiliate Marketing. As you grow you may want to get your own merchant account. Transitioning is seamless- we’re a Level 1 PCI compliant gateway, certified and integrated with 97% of US and a bunch of the biggest international payment processors/ networks. Transition to your own merchant account any time, in 5 minutes without any coding- all your data, integrations, reporting, subscription plans, custom hosted payment pages, affiliate marketing… remains intact. And your customer data is YOUR data, fully portable. Thanks for the kind words re: SaaSy, Greg. It’s important to note that the true processing costs are in fact 3.5-4% when you factor in American Express transactions, non-US transactions, corporate credit cards, rewards cards, chargeback fees (we pay those when they occur), bank fees (we pay those too), etc. The common perception is that the expense is ~2%, and that is incorrect for those who sell globally and/or accept payment methods other than US Visa and MC “qualified” transactions. Also, unlike the others, with SaaSy, end users can pay using US Dollar, Euro, Pound, Australian Dollar, Canadian Dollar, Yen, Swiss Franc, Danish Krone, Hong Kong Dollar, New Zealand Dollar and Singapore Dollar. Not offering order pages localized by language (we support 19 languages) and by currency means a far higher order page abondonment rate. Users don’t want to pay in a foreign currency, pay a price displayed like $24.93727272 vs $25.00, read an order page in a foreign language, or get charged surcharges on their credit card statements due to currency conversion. With SaaSy, all of this is addressed, leading to higher international sales. SaaSy clients can be located almost anywhere; in fact, the majority of our clients and their end users are outside the US. Our clients don’t need to obtain a merchant account (incredibly difficult to do especially if you’re located outside the US or you are in the US and want to accept foreign currencies) because we are the reseller, the merchant of record, and so they don’t have to deal with PCI compliance, global tax compliance, chargebacks (we even pay the chargeback fees when we lose a battle), etc. Dan, I’m feeling some deja vu here. As I explained after your comments on my previous post, the calculator does incorporate my an estimate of the costs you describe, so it is apples to apples (with one exception noted in the post and below – chargebacks) on the pricing aspect. In fact, the pricing of the new option I am describing here, Stripe, is completely inclusive of processing costs. And they don’t require you to obtain a merchant account. The one exception, a cost that Saasy covers and Stripe doesn’t, is chargebacks. I also don’t include this in the calculator. The international aspect is an interesting one that I haven’t considered before. With the release of Stripe, Saasy’s price now represents a hefty premium. Perhaps the fact that you absorb chargebacks and have better international support will justify that for some people. Of course, people will also have to trade that off against the lack of data portability. Stripe and Braintree are both strong in this respect. It is all a trade off. I hope my posts help to make the factors more clear. Hey aren’t there some averages on # of chargebacks per 1000 transactions you could just factor into your cost calculations? I mean, $15 is a lot but if it never happens, who cares right? I think it would also be a factor of your average transaction size. I can definitely see people who do lots of micro transactions + have a high chargeback rate, stripe might be much much more expensive. The credit card number is directly typed into your website, though. Not only does Stripe require full PCIDSS compliance from you (and may demand proof of it at any time, per their terms), but you absolutely need to be compliant. Any lapse in your security that lets someone edit your page means they can transparently steal the credit card number out of your form the same way Stripe steals it out of your form. It doesn’t matter that the form isn’t posted to your server. Great breakdown! Few points on Recurly.com, as that’s what I’m using for a simple subscription service in the $20-$50 range. 1. Recurly had (and may still have) some type of a special relationship with Intuit Merchant Services in which you didn’t need some extras that were required with Authorize.net and Braintree. This brought my monthly fees way down to the point where I’m only paying Intuit a low monthly fee plus transaction fees. I don’t plan on using it but it sounds very interesting. Definitely take a look. Dan, thanks. This wasn’t in Stripe’s terms at the time of writing. I’ll need to update with Recurly’s new pricing at some point. And perhaps add cheddargetter. If I can find some chargeback data I can include that per Foo’s suggestion. Update: just added Recurly’s new pricing. Makes them the low price leader if you use their payment gateway. I just got a chat with Stripe people – great support even on a Sunday! They clarify for me their term of service. The compliance to PCIDSS apply only if you are not using the Stripe.js. In this case you are responsible to store the sensitive data and so you need to be PCI compliant. “The credit card number is directly typed into your website, though.” -> my understanding is that while using Stripe.js the sensitive data is never passed to you but stay between the customer browser and Stripe server and that this connection is protected via SSL. Braintree has something similar but I prefer the Stripe approach. Maybe I’m missing something, but shouldn’t the Merchant Account have a Transaction Fee ($) in your calculator? It seems to me that most Merchant Accounts charge anywhere from $.20 – $.30 per transaction. Which makes a huge difference when comparing Recurly to a service like Stripe, which already has the merchant account fees bundled into their costs (and which I would think make Stripe the low price leader). I figure I must be missing something here, just not sure what. Phil, I think you’re right. I initially got gateway and merchant account quotes from FeeFighters, which combines the two, so the per transaction cost was built into the gateway cost. But now that I added the Recurly option that includes the gateway I need to break that out. I’ll do so some time in the next couple of days. I should add that although I have priced gateway and merchant account costs, I only have personal experience with Stripe and Braintree, both of which build these into the offering. I have now broken out the flat per transaction fee separately for the payment gateway and merchant account. This does indeed make Stripe the lowest cost option for the quotes I have on gateway and merchant account fees. Thanks Phil for pointing that out. Glad to have helped – the numbers seem to be correct now. Thanks for taking the time to make and share this calculator! Which product would you recommend to someone who is not a developer??? Collin, I’m sorry but I really don’t know. I am approaching it from the point of view of a developer, so my comparison is built on that. – Different pricing metrics – % of revenue, transaction fees, number of subscribers. You end up matching oranges to apples. – Changing pricing – Recurly, Chargify, Spreedly etc have all made major pricing changes in the last 6 months. Justin, no question there are a lot of variables. I don’t understand your first two points though. I’m not sure what a “Dedicated Subscription Application” is and how that differs to what Stripe and Braintree offer. And the variables in your second point are all included or easily deduced. The 3rd is a good point. Things change all the time — people should check the changelist on the calculator page to see when last I updated the math. Would you like to point out specifics about where I can improve the graph (in addition to adding Spreedly of course)? I can explain Justin’s point, at least the first one…Braintree and Stripe are “Merchant Services Providers” that also provide a payment gateway that includes recurring payments. 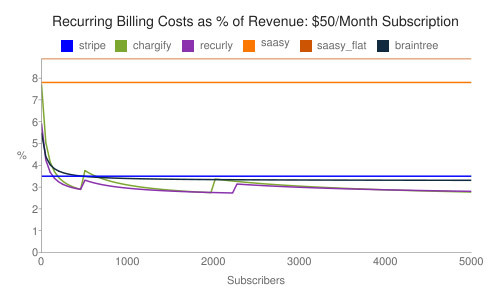 Whereas Chargify’s, Recurly’s, etc’s product is the recurring billing component. That is one of the reasons that I am trying to figure out why someone would go with a “dedicated” service versus one that is included with the payment gateway. We’ve been using Stripe and it was a cinch connecting our custom backend with their API. Great documentation unlike Paypal which was super confusing and too time consuming to setup. I like the fact that our customers never leaves our site. I give Stripe 5/5. Great application. Another one, that seems to be an underdog is Merchee.com, would be great to include as well. Unfortunately, SaaSy doesn’t allow the seller to sell advertising subscriptions, so anyone trying to simply transact ad buys on their own site with a purchaser, on a one-time basis or a recurring basis, is forbidden on SaaSy. I’m from Brazil and I’m launching a web app. As you know options for non-US merchants are pretty limited. Let me ask you: What about PayPal? Awesome article and calculator. Thank you for that. I don’t understand. Braintree is the exact same model and price as stripe, if not lower (2,29% you can get with midlevel volume) per month. So it would be the same or cheaper than stripe, no?